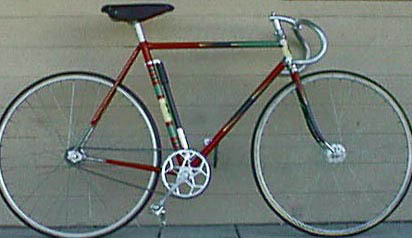 A 1930s track bike, formerly owned by John Pergolezzi, now in the possession of Ernie L. Dolan. A previous owner added some paint details some time in the 50s, in a style very influenced by older British bikes. The top- and bottom-most seat tube bands, and the extensions on the top tube and downtube paint spears - all the work done in black with gold striping - are not original. I suspicion many of the components may have been replaced at that time as well. From the small photo it appears to have standard cottered steel 5-pin cranks with a Williams-type chainwheel. The hubs look to possibly be FB or Airlite/BH, and the track stem with the downward curve is very much like a Toni Merkens model.